In May 2017, countless South African women took to Twitter and Facebook to share their harrowing experiences of abuse under the hashtag #MenAreTrash. The outpour of tweets and Facebook posts was sparked by the murder of Karabo Mokoena, a 22-year-old woman who was allegedly killed and burned by her boyfriend. Although the wording of #MenAreTrash has caused controversy, that will not be the focal point of this column. Instead, I want to focus on how social network sites (SNS) have provided women in the Global South with a platform to voice their opinions and bring to light conversations that often remain in the dark. In this thread, @BlackSnow99 shares her experience of abuse under the hashtag #MenAreTrash. Please note that this thread could be triggering. I want to focus on how social network sites (SNS) have provided women in the Global South with a platform to voice their opinions and bring to light conversations that often remain in the dark. Links’ research, “77% of women in Limpopo province, 51% of women in Gauteng, 45% of women in the Western Cape and 36% of women in KwaZulu-Natal have experienced some form of violence (emotional, economic, physical or sexual) in their lifetime, both within and outside intimate relationships.” However, the epidemic of women abuse is not exclusive to South Africa and is, in fact, a global concern. According to UN Women, “it is estimated that 35 per cent of women worldwide have experienced either physical and/or sexual intimate partner violence or sexual violence by a non-partner at some point in their lives. However, some national studies show that up to 70 per cent of women have experienced physical and/or sexual violence from an intimate partner in their lifetime.” Arguably, the abuse of women is “normalised and/or institutionalised in [various] cultural practices and acceptable behaviour in many societies. At the same time, it is taboo and often controversial to discuss” (Fascendini & Fialová, 2011:15). So, what is it about SNS that encourages women to open up about such deeply personal and triggering experiences? I believe one of the fundamental reasons is because there is a sense of solidarity created on SNS. It is estimated that 35 per cent of women worldwide have experienced either physical and/or sexual intimate partner violence or sexual violence by a non-partner at some point in their lives. However, some national studies show that up to 70 per cent of women have experienced physical and/or sexual violence from an intimate partner in their lifetime. There are several features on SNS which aid the development of solidarity. For instance, hashtags, the option to tag someone in a piece of content (post, photo, video etc. ), the fact that you can connect with people globally despite your physical location (cross-boundary dialogue), the opportunities for network-building and the ability to create counterpublics. Hashtags are an effective tool for building solidarity as individuals who identify with the hashtag can engage in the discussion with the expectation that they will be connecting with like-minded people (granted that trolls do not try and hijack the hashtag with ulterior motives). Hashtags can also “trend” or go viral suggesting that numerous people are contributing towards the conversation which could make participants feel like they are not alone thus increasing a sense of solidarity. Hashtags are an effective tool for building solidarity as individuals who identify with the hashtag can engage in the discussion with the expectation that they will be connecting with like-minded people. Hashtags can also “trend” or go viral suggesting that numerous people are contributing towards the conversation which could make participants feel like they are not alone thus increasing a sense of solidarity. South African women are not the only ones in the Global South turning to SNS to raise awareness about woman abuse. #NiUnaMenos – Spanish for “not one [woman] less” – is a popular, ongoing hashtag used in in Latin America against femicide. The hashtag was initiated by Ni una menos, an Argentine feminist movement, who describe themselves as a collective cry against gender violence. Ni Una Menos organises various marches to raise awareness about femicide and their use of SNS is arguably crucial to their efforts. For instance, through their use of SNS they are able to use time- and cost-efficient communication channels (Facebook and Twitter), they are able to communicate with numerous people in real time and SNS can be accessed anywhere and anytime. SNS are also effective for Ni una menos’ efforts as they can use SNS to encourage their followers to get involved in offline action such as the marches they organise. A prime example of an effective offline activity organised by Ni una menos, in collaboration with other activist groups, was a first-ever women mass strike on October 19, 2016. The mass strike was in response to the murder of 16-year-old Lucía Pérez who was drugged, repeatedly raped and killed. The strike saw tens of thousands of women taking to the streets in cities across Argentina, Chile, Peru, Bolivia, Paraguay, Uruguay to protest against femicide. A prime example of an effective offline activity organised by Ni una menos, in collaboration with other activist groups, was a first-ever women mass strike on October 19, 2016. The mass strike was in response to the murder of 16-year-old Lucía Pérez who was drugged, repeatedly raped and killed. Women hold a sign reading, “The only death we want is the death of the patriarchy” in Santiago, Chile (AFP PHOTO / CLAUDIO REYES). While social media has afforded women in the Global South with a platform to voice their opinions, we cannot forget that lack of access to the internet prevents millions of women from participating in online spaces. According to a report released by We Are Social (2017), of a global population of 7.476 billion people, 3.773 billion are internet users. Although 50% of the world’s population uses the internet, internet penetration is dominated by populations in North America (88%) and West Europe (84%). Whereas regions like Africa (29%) and South Asia (33%) have the lowest internet penetration figures. Considering the abovementioned figures, when looking at the participation of women online one should bear in mind the relatively low Internet penetration in Africa and South Asia. Thus, one could propose that from a global perspective online populations consist mostly of relatively well-to-do and privileged women (Newsom & Lengel, 2012:33). The report further reveals that 2.789 billion people are active social media users (delivering 37% global penetration). 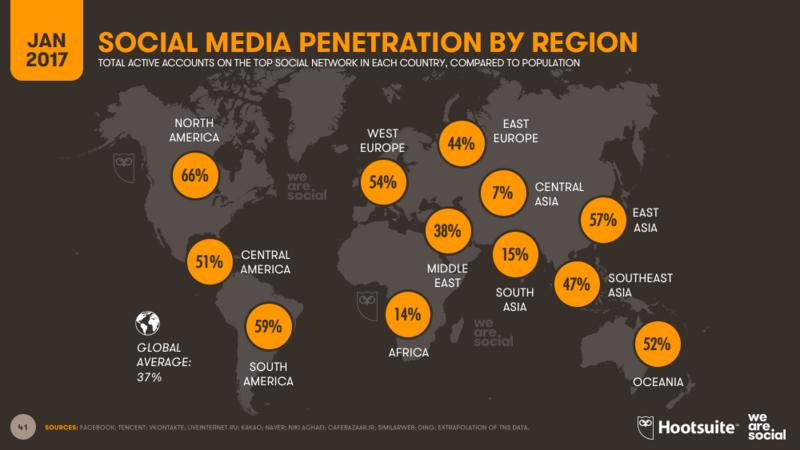 When looking at the highest and lowest social media use figures per region, the total active accounts on the top social network in each region, compared to population are North America (66%), South America (59%), East Asia (57%), South Asia (15%), Africa (14%), and Central Asia (7%). Femicide and woman abuse are crucial global issues which are often considered taboo thus are not discussed, especially in public spaces. However, women in the Global South are turning to SNS to voice their frustrations, raise awareness, mobilise, organise offline action and feel a sense of solidarity. Although internet access is dominated by the Global North it is hoped that in the future internet access will be more equally spread thus levelling the online participation of women worldwide. Although femicide and woman abuse will not be solved overnight, the fact that women are speaking up and mobilizing are signs of hope for the future. Women in the Global South are turning to social network sites to voice their frustrations, raise awareness, mobilise, organise offline action and feel a sense of solidarity. Fascendini, F. & Fialová, K. 2011. Voices from digital spaces: Technology related violence against women. APC-WNSP, November 2011. Newsom, V. & Lengel, L. 2012. Arab Women, Social Media, and the Arab Spring: Applying the framework of digital reflexivity to analyze gender and online activism. Journal of International Women’s Studies. 13(5):31-45.